The author Alokkrishna Chakraborty is a well-established researcher of Nataji (Subhash Chandra Bose). Netaji's devoted, this author grew up in the Swadeshi and progressive environment. He wrote a number of information-related books about Subhash Chandra Bose and he is at the top of popularity as a researcher of Nataji. The author is not just Subhash-researcher, he is also an established talented writer. He has arbitrary movement in different branches of literature. Alokkrishna is also very popular in children's literature. 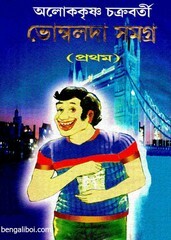 Today I want to share an ebook of his created character 'Bhombolda'. Collect the ebook pdf of Bhombalda Samagra (part-1). The pdf has 322 quality pages, 10mb file size.